fantastic EP - 'dancing with a shark' captures the essence of churning, driving acid on the low end and legowelt's signature walls of keyboards. 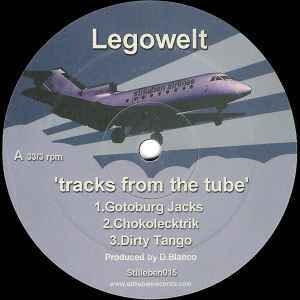 Legowelt, aka D. Blanco, are back with five tracks of searing electronic discoid grooves. Starting up, the arpeggiated Gotoburg Jacks - heavy analogue synths over the beat, some superb chord changes with a full on discotized break that takes you away. Dirty Tango, is the more spangled standing out with wobbly synth that is almost P-Funky over the crunchy drums, filters going crazy and the groove kicking in, ace.